Home > Resources > Mozaik > The Face of God on Facebook?! The Face of God on Facebook?! It’s end of July 2011. As so many others I’m shocked and grieved when I hear of the attacks in Norway. How is it possible that someone can do that in the name of Christianity? 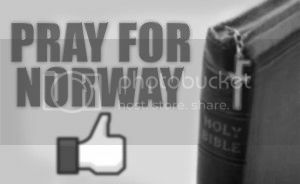 The next day I see on Facebook a ‘Prayer for Norway’; an ‘event’ created by the World Council of Churches. I am invited to pray that night at 9 pm GMT. A link directs me to their website, were I find a moving prayer, written on the day of the shootings. I share the event on my wall and encourage friends and family to pray. At 9 pm I stop with everything I’m doing and pray, knowing that people all over the world will be praying this prayer now or in the coming day. We would like to thank you all for your prayers and words of support. It is encouraging knowing that people, from different parts of the world, are praying in solidarity with the people of Norway for healing, visitation, justice and peace. At the end of an average workday, I come home; the first thing I do is turn on my computer. Facebook is my homepage on the Internet. I read up on what my friends have been doing, add some ‘likes’ and comments here and there and follow the links to entertaining or interesting articles. Before I know it, it’s an hour later. I haven’t done very much, except entertain myself and I tell myself off for not keeping track of the time. Two of my recent experiences with using the Internet (and more specifically Facebook) that came to mind when I was asked to write something about the development of digital technology and the question whether it brings us closer or further from God. Christians have been asking themselves this question ever since the first technological invention. Some Dutch Protestant Christians refused to buy and use a radio, convinced that it was the instrument of the devil. A few decades later, the same happened when the television entered in Dutch homes. The Internet did not cause that much controversy, though extensive use of the Internet is certainly frowned upon (and even forbidden) among various small but very conservative groups of Christians in the Netherlands. They are of the opinion that the Internet brings ‘the world’ with all its temptations into the home. To protect themselves and their children they use the Internet sparingly, for instance only for work or school and not for (frivolous) amusement. What’s more, the Internet disrupts family life and social interaction with friends and family. When I look at my own experiences with the Internet, I know that they are partly right. I like technology and all it has to offer and I spend more and more hours online. Chatting on Facebook, surfing websites, checking what Ebay has to offer or reading up on interesting blogs. And, to be completely honest, sometimes it does keep me away from spending time face to face with friends or even with God. Sometimes I intend to read a good book, go over to see a friend, or spend time in prayer, but then somehow I end up behind the computer and forget all about what I planned to do. On the other hand, I passionately believe in using technology for good things, things which bring us closer to God. When praying for Norway, alone in my room, I felt very much connected with other Christians. The prayer written on the website lifted my soul. For me that time of prayer was a sign of the Spirit at work in this world, despite all evidence to the contrary. In this case, the Internet was a means to uniting Christians all over the world. Moreover, it provided us with a way to put our feeling of shock and grief into words. I have experiences similar to this one when I search for fresh thoughts on a certain Bible passage or read about someone’s story of faith in a blog. So do I think that digital technology can bring us closer to God? Yes, I do! Provided that we use it wisely and faithfully and never forget spending time ‘face to face’ with God and others. – Annelies is an (Anglican) part-time studentpastor for international students in Utrecht. She also works as a pastoral counsellor. In 2006, she graduated from Utrecht University with a Master’s in Biblical Studies. When not working, she spends her time on friends and family, outdoor activities, reading and singing. « Previous Post Does the Development of Technology Bring Us Closer to God?